The Nest thermostat famously created the notion of home-control gadgets that learn from and adapt to a homeowner’s activity patterns. But a thermostat is limited as to what it can sense, what it can learn, and what it can control. 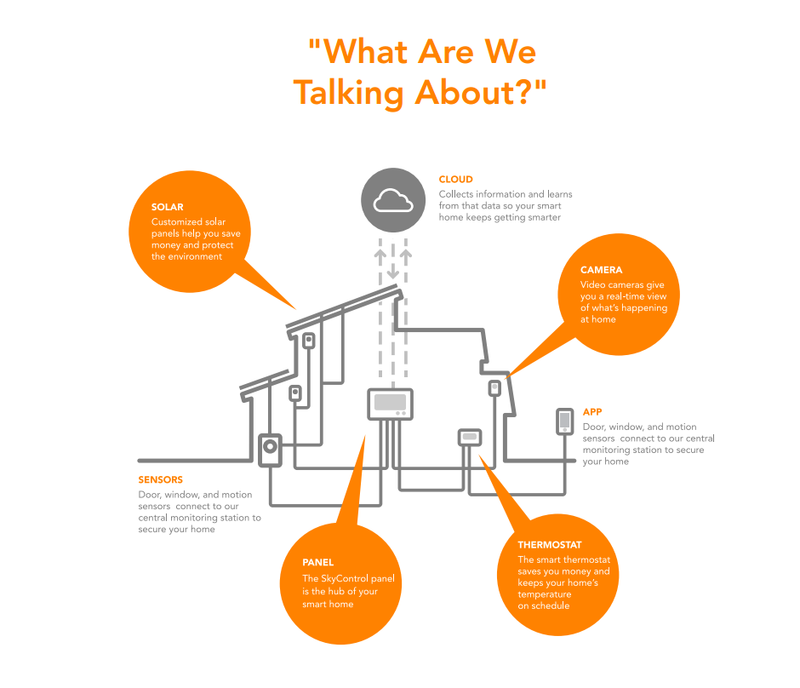 Vivint’s second-generation home-control system—Vivint Sky—uses dozens of sensors in addition to a thermostat, and it monitors and controls not just your heating and air-conditioning system, but also your home's lighting, door locks, small appliances, video cameras, and security systems. Two key components distinguish Vivint Sky from Vivint’s existing home-control system: The new offering comes with an all-new control panel, and there’s a new cloud-based monitoring system that runs on Vivint’s servers. 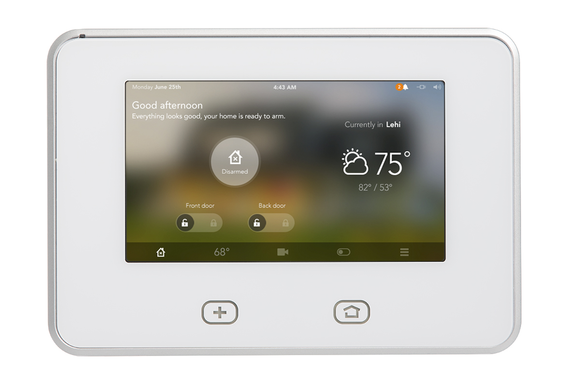 Vivint contracts with SaaS (Software-as-a-Service) provider Alarm.com to manage its existing home-control service. Vivint CEO Todd Pedersen explained to me that Vivint Sky will track a homeowner’s activity patterns using its motion, door, and window sensors; lighting and small-appliance modules; smart thermostat and door locks; and other devices installed inside your home. A wall-mounted control panel collects this data and uploads it to Vivint’s servers. Algorithms running on those servers analyze all this data and then send the customer suggestions as to how they can improve the home’s security and energy efficiency. Here's an example of how it works: If your alarm system is turned on and your heater or air conditioner are running, but none of the sensors in the home detect activity that would indicate that anyone is home, Vivint Sky will presume that you’re heating or cooling an empty house. It will send a message to your smartphone suggesting you use Vivint’s app to adjust the temperature accordingly. Over time, the system will come to recognize patterns of activity. If you’re typically away from home from 8 a.m. to 5:30 p.m., for instance, it might suggest a program for your thermostat so that you’re heating or cooling your home only when someone is typically inside it. The Nest can do this, too, of course, but Vivint's system can tie all your home systems together and make similar recommendations for your lights should go on and off, and when to arm your alarm system. It can also alert you when there's activity inside your home when you didn't expect anyone to be there, and lots more. Vivint will offer Vivint Sky apps for Android and iOS smartphones and tablets. Install Vivint’s app on your smartphone, and geo-fencing technology will evaluate your physical location, so that it can turn your exterior lights on moments before you arrive in your driveway. Forget to arm your alarm system when you leave, and the system will send you a text message to let you know your home is unprotected—if the sensors inside the house don’t detect movement indicating someone is still there, that is. Blackstone sold 2Gig in a separate deal a few months later, but 2Gig’s principal engineering team and the intellectual property behind the new panel stayed with Vivint. I haven’t had an opportunity to evaluate the SkyControl panel—a hands-on review is in the works—but it looked solid when Pedersen demoed it for me last month. The SkyControl panel is equipped with a 7-inch capacitive touchscreen, and it has a hard-drive-based DVR to store video clips recorded by the system’s surveillance cameras. You can watch live streams from those cameras or watch recorded video clips right on the panel. You can also stream live or recorded video to a smartphone, tablet, or PC. The panel is equipped with a GSM module, so it can communicate with Vivint’s servers even if a burglar cuts the power to your home (the panel runs on AC power, with a battery backup). The Vivint Sky system provides two-way voice communication between the SkyControl panel and Vivint’s central office, so you can talk to a dispatcher in the event of an emergency. If a burglar or fire alarm is triggered, a dispatcher will try to reach via the control panel before calling first responders. This reduces the chance of false alarms. Vivint says the panel will still alert its central office of a break-in even if the burglar destroys the control panel during its programmed entry delay, a feature that has previously been available only from Alarm.com. An entry delays give you 20 to 30 seconds to enter the house, reach the control panel, and disarm the alarm system before an alarm is triggered. In some competing systems, including ADT’s Pulse, a burglar can defeat an alarm system by locating and disabling the control panel during the entry delay. ADT’s solution to this problem has been to hide some of its system components, including its GSM module, in sturdy metal boxes that are typically mounted in an out-of-the-way location, such as a clothes closet. During our briefing on May 28, Pedersen told me Vivint had seeded the new SkyControl panel with roughly 30,000 of its existing customers. But a Vivint press representative told me today that only new Vivint customers will get the new hardware and service. Existing customers will continue to use the existing Go! Control panel and Alarm.com service, but they’ll be able to upgrade down the road—I’m sure customers with expiring contracts will find themselves at the front of the line. Aside from the new control panel and the learning features, I don’t think Vivint’s customers will notice much of a difference. Being a SaaS provider, Alarm.com skins its online user interface with Vivint's logo and colors, and Alarm.com employees identify themselves as Vivint employees when responding to alarm events. Vivint has 800,000 customers, but it doesn’t break down which service tiers they subscribe to (the company offers home-security and home-energy management tiers separate from home control. It also has a solar-energy division).